As you probably already know, many new appliances draw “phantom power” even when they’re turned off. This slow, steady trickle may not be much when it comes to a single device, but ask yourself: How many different devices do you leave plugged in all the time? Smart phones, DVD players, coffee makers, flatscreen TVs, speaker systems, printers, copiers… the horde of little power sucking vampires can add up to big bucks over the course of a year. While one solution is to unplug these devices when you’re not using them, this is a pretty big hassle. It doesn’t take too many trips to the chiropractor to figure this one out. One practical solution? Install outlet plugs with on/off switches! 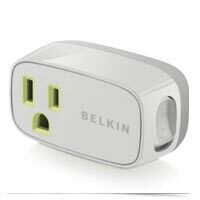 Even if you don’t have them installed in a new construction home, you can buy after-market affordable devices, such as Belkin’s Conserve Power Switch ($5.99). For a modest investment you can lower your bill and conserve energy!